When I get back home for a vacation a couple of months from now, I am planning to declutter my room. Of course, the first thing that I need to do is to organize! I would admit that sometimes, because of my busy schedule, I never have the time to organize my personal stuff. Although I tend to allot a schedule for doing this, things were often left unfinished. I used to buy accessories and jewelries before. I am not really much into fashion but somehow, I need to mix and match my outfits for work. 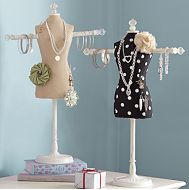 To get this done, I have to invest on some pieces of quality jewelries and accessories. 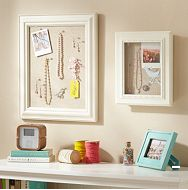 Browsing for some cool jewelry organizers, I fancied for this very simple design from PBteen. I think it's handy and unique but I preferred a covered one to protect my accessories. After all, I'm planning to buy a set of pandora necklace and earrings. But my problem is where to find pandora charms. I really love their design and I'm thinking of getting one for my daughter, too. I think, I have to consider another design for my jewelry organizer since I want to protect my accessories collection. I think, I would prefer this design as it is a space saver as it can be hang on the wall and has a glass cover to protect my accessories from dust. Sometimes it's not really easy to choose what would be best for your home sweet home but once you can find something that can make you get organized and pleased with it's design, then the feeling is very rewarding.